Tremors are a part of everyday life in big Alaska. Bush pilot, Xavier Markovic, goes with nature's flow and loves it. He guides guests through Denali National Park to show off his beloved state. Until health issues arise for his mentor, Daniel Chevalier, and Xavier flies him to the hospital. An almost fatal tumble down a mountain ends Devin Chevalier's professional mountain biking career and brings him to a crossroads. Learning his grandfather is ill, he makes a rash decision. Uprooting his life for a chance to meet Daniel, he crosses paths with a brash Alaskan. 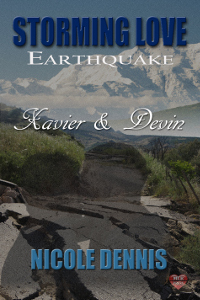 Alaska throws them another surprise in the form of a huge earthquake. Differences put aside while they struggle to survive.